(1) efforts or measures taken by the insurer to resolve the coverage dispute promptly or in such a way as to limit any potential prejudice to the insureds; (2) the substance of the coverage dispute or the weight of legal authority on the coverage issue; and (3) the insurer's diligence and thoroughness in investigating the facts specifically pertinent to coverage. So what else do you need to know about lack of good faith causes of action? The following ten things can help defense counsel advise insurers who face these types of claims. 1. Most lack of good faith claims have to be considered by the Maryland Insurance Administration first. Lack of good faith claims are made by an insured against its own insurer. Such claims did not exist under common law. Johnson v. Federal Kemper Ins. Co., 74 Md. App. 243, 246-47, 536 A. 2d 1211, 1212-13 (1988), cert. denied, 313 Md. 8, 542 A.2d 844 (1988); Harris v. Keystone Ins. Co., Civil No. CCB-13-2839, 2013 WL 6198160, *2 (D. Md. Nov. 26, 2013) (unreported). Accordingly, lack of good faith claims are statutory creations. As indicated in Section 3-1701, the insured must first exhaust its administrative remedies before the Maryland Insurance Administration (“MIA”) pursuant to Md. Code Ann., Ins. § 27-1001 unless its action fits into one of three limited exceptions: (1) a small claim within the jurisdiction of a Maryland District Court; (2) where the insurer and insured agree to waive the MIA requirement; or (3) where a claim involves a commercial insurance policy with policy limits that exceed $1,000,000. If an insured’s counsel attempts to file a lack of good faith claim in civil court before exhausting the prescribed administrative process, the insurer should pursue a motion to dismiss. The intricacies of these exceptions to the exhaustion requirement are sometimes overlooked. First, it may be the amount of the claim (which is the case for small claims) or the limit of coverage (which is the case for the exception dealing with large commercial policies) that is determinative of the applicability of the exception. For example, if a commercial policy provides a property limit of $250,000 and an uninsured motorist coverage limit of $2 million, a claim for lack of good faith respecting the property claim would have to proceed before the MIA, while a lack of good faith claim relating to uninsured motorist benefits could proceed in civil court. Second, the statutory exceptions are very precise as to dollar amounts. For example, if the limit of the commercial policy is $1 million, then the lack of good faith claim must be pursued initially before the MIA. If the limit of the commercial policy is $1 million plus $1, then the lack of good faith claim can proceed in civil court. The $1 makes a world of difference. Third, it is sometimes difficult to determine the coverage amount for the claim at issue. In Lanham Servs. Inc. v. Nationwide Prop. & Cas. Ins. Co., No. PWG-13-3294, 2014 WL 2772227, *4 (D. Md. June 18, 2014), the declarations page did not specify a precise and detailed limit of coverage. The court permitted the insured to aggregate the limits for each building insured under the policy in order to determine if the coverage limits for property damage totaled more than $1,000,000. This aggregation was allowed even though the claim itself was only for $637,100. Consequently, defense counsel must carefully review issues concerning jurisdiction and exhaustion. Finally, it should be noted that a claim that fits one of the exceptions can still be instituted by the filing of a complaint with the MIA. 2. Not all lack of good faith claims are civil claims. There are two types of lack of good faith claims: civil lack of good faith claims and administrative lack of good faith claims. Civil lack of good faith claims are those set forth in Section 3-1701 of the Courts & Judicial Proceedings Article. Under this statute and the corollary statute contained in Section 27-1001 of the Insurance Article of the Maryland Annotated Code, these types of claims require a civil complaint filed with a specific form and information. See http://www.insurance.maryland.gov/Consumer/Documents/27-1001complaintinformationsheet06-09.pdf. In addition to the civil complaint, the insured complainant must provide MIA with each document that the insured has submitted to the insurer for proof of loss. Once filed, there are particularized requirements regarding the response that must be filed by the insurer. The response must include all documents from the insurer’s claim file (with the documents that are claimed to be privileged being submitted to the MIA in a separately sealed envelope). The insurer’s response, which is often quite lengthy, must be filed within thirty days after the complaint is forwarded to the insurer by the MIA. Considering the scope and prescribed form of the response, the insurer’s filing is oftentimes a difficult and herculean task. Counsel representing insurers should understand that the MIA cannot grant an insurer or its counsel an extension of time in which to file a response. The MIA, however, will allow extensions of time that have been consented to by the insured or the insured’s counsel. After a review of the paper filed by both sides, the MIA will rule on whether the insured has, on paper, proven that the insurer acted with a lack of good faith. Once that decision has been made, there are various avenues for contesting the decision—primarily by the aggrieved party requesting a hearing or filing an appeal to the Circuit Court. Once a decision is final, the civil action can be filed. Administrative lack of good faith complaints are also allowed. These complaints, which are filed under Section 27-303(9) of the Insurance Article follow an entirely different route within the MIA. Although these lack of good faith claims are also based on Section 27-1001, the administrative complaint process is not as rigid as the civil complaint process. For example, an insured’s simple email to the MIA complaining that a claim was denied and that the insurer acted without good faith is enough to start the administrative complaint process. This administrative complaint triggers an administrative review which, unlike the civil complaint process, oftentimes has the MIA repeatedly requesting information from the insured and the insurer. Unlike the civil complaint process, there are no rigorous timelines for the MIA to consider and decide the issues relating to the administrative complaint. The investigatory process can—and oftentimes does—take months. At the end of the process, the MIA issues an administrative determination that is less formal than what is required for decisions on civil complaints. Generally, the administrative determination is in the form of a letter. After the administrative determination is made, the aggrieved party may request an administrative hearing. After such a hearing, an administrative law judge renders a decision, which can be appealed to the Circuit Court. This administrative procedure does not allow for the awarding of enhanced damages. Importantly, a decision on an administrative Section 27-303 complaint has no relationship to the filing of a Section 27-1001 civil complaint. Specifically, a ruling on an administrative complaint does not constitute exhaustion of administrative remedies under Section 3-1701. Defense counsel must clearly review a lack of good faith complaint to determine whether the civil complaint procedure or the administrative process procedure applies. 3. The MIA may not rule on a lack of good faith civil claim. 5. the amount of damages, expenses, litigation costs, and interest, as applicable and as authorized under paragraph (2) of this subsection. Md. Code Ann., Ins. § 27-1001(e)(1)(i). Despite the prescribed deadlines, the MIA might not make a decision within the time frame set forth by statute. This failure to act may be because of an overbearing workload (the MIA is a busy agency), changes in personnel, or other constraints. It is important for an insurer’s counsel to understand what happens if a decision on the civil complaint is not rendered by the MIA within the ninety-day period. As indicated in Section 27-1001(e)(1)(ii), if the MIA does not make a decision on the Section 3-1701 complaint in a timely manner, then the insurer is deemed to have prevailed on the complaint. If the insured does not contest that deemed decision, then the decision is final and a civil action can be filed. An insured that wants to contest the deemed decision must do so between the ninetieth day and the 120 days after the civil complaint was filed. If no such request for hearing or appeal is made by the insured within that time, the decision in favor of the insurer is considered to be a final. After the decision is final, a civil action may be filed. 4. It is not clear whether a lack of good faith claim may be pursued where an insurer continues to investigate a claim. Claims investigations often take a significant amount of time. This is particularly true if there are issues of coverage, scope, and valuation to be considered. Sometimes insureds (or their counsel) jump the gun and file a lack of good faith claim even though the claim is still being investigated. When an insured files a lack of good faith complaint prior to the time that a final determination on a claim is made, an insurer’s counsel must determine whether or not the filing of such a claim is appropriate or filed prematurely. The plain language of “decision of a claim” necessarily implies that a claimant has the right to bring a §27-1001 action when the insurer has made a final decision on a claim. An insurance company makes any number of decisions about a claim during the process of investigation and making a determination on a claim. The Maryland General Assembly did not intend to provide insureds with a right to bring an action each time an insurance company makes any type of decision regarding a claim, such as a request for prior medical records. Therefore, the Commissioner finds that “decision on a claim” refers to an insurance company’s ultimate determination on a claim. Under this interpretation of the statue, insureds cannot pursue a claim under §27-1001 if no final decision has been made on a claim. Lanham Servs., Inc. v. Nationwide Prop. & Cas. Ins. Co., No. PWG-13-3294, 2014 WL 2772227 (D. Md. June 18, 2014), appears to present a contrary result because the Court in that case refused to grant a motion to dismiss where an insurer had not made a final decision on a claim. Consequently, it is unclear whether or not a lack of good faith claim is maintainable where the claim is still being investigated. 5. There are filings that an insurer must make with the MIA if a lack of good faith civil claim is pursued in a civil case. An insurer is expected to notify the MIA if a Section 3-1701 action is filed in any civil court. The type of notice depends on whether there has been a previous determination by the MIA on the civil complaint. See http://insurance.maryland.gov/Insurer/Documents/bulletins/16-30-New-Reporting-Instructions-and-forms-27-1001.pdf. An insurer that does not file the requisite notice can be fined and subject to other administrative action by the MIA. If the civil action is filed after there has been a determination by the MIA under Section 27-1001 of the Insurance Article, an insurer must complete and file a Notice of Disposition form. This form must be filed within thirty days after the adjudication of the Section 3-1701 claim by an adjudicatory body. It is not clear whether this filing requirement would relate to non-final orders or only to final orders of a court. Because the form requires a listing of the disposition of each count in the complaint, it appears that only final decisions are subject to reporting. The notice must list the court, the type of coverage at issue, the prior dispositions of claims, the amount sought in the complaint, the determination made, the amounts of any awards, and whether any further proceedings (i.e. appeals) are to be filed. If the matter is appealed, another notice must be filed at every adjudicatory level. There is also a notice requirement for civil complaints that were not filed initially with the MIA. The form that must be filed for these complaints is a Notice of Pending Complaint form. The information that is required to be included in such form is essentially the same as the Notice of Disposition form. However, the form also requires information as to why the Section 3-1701 complaint did not have to be initially filed with the MIA. These notice requirements only apply to Section 3-1701 lack of good faith claims. If an insured files a common law bad faith claim, an insurer is not required to file a notice with the MIA. 6. Information on lack of good faith claims is reported to the Maryland general Assembly. Pursuant to Section 27-1001(h), the MIA must report to the Maryland General Assembly various information regarding lack of good faith actions on a yearly basis. The information contained in the MIA’s report includes the number of lack of good faith complaints filed, the administrative and judicial disposition of such complaints, and the number and type of regulatory enforcement actions taken by the MIA for unfair settlement practices under Section 27-303(9). The report for 2015 can be found at http://insurance.maryland.gov/Consumer/Appeals%20and%20Grievances%20Reports/2015-Absence-of-Good-Faith-Cases-Report.pdf. Insurers that have been found to have violated their statutory good faith obligations are specifically named and the specific actions that constitute "lack of good faith" are described. For example, in the 2015 report, an insurer’s failure to investigate, an insurer’s failure to notify the insured of information, and an insurer’s actions that were in the avoidance of payment of a claim are specifically noted. 7. There is information on the MIA website regarding lack of good faith claims. The MIA’s website has a multitude of information that a lawyer may want to consider in a lack of good faith case. In addition to information contained in the annual reports to the Maryland General Assembly mentioned above, such reports include statistical information regarding the types of claims giving rise to Section 27-1001 complaints. There is also information pertaining to the legislative history of the statue and the MIA’s interpretation of the statute. Such information can be useful in civil cases as the breadth and construction of the statutory language. The website also includes MIA decisions, some of which contain learned discussions of coverage issues. An insurer’s counsel should also be aware of information that an insured’s counsel can learn from the MIA’s website. Although somewhat difficult to find, the website contains all lack of good faith decisions rendered against each specific insurance company (Quick Links à Orders and Exams Search). These orders may describe processes used by an insurer, information regarding practices of particular claims adjusters, and coverage arguments that insurers have used to defend claim decisions. Defense counsel may want to review such decisions to prepare the defense of their lack of good faith case. 8. Decisions on lack of good faith claims trigger concerns that are more than just the decision on the claim itself. For those who do not practice regularly in the field, it may be perplexing as to why so much time and effort is used to defend a lack of good faith claim. Adverse decisions on such claims can, however, trigger concerns regarding administrative investigations, class actions, and punitive damages awards. The legislative history of the lack of good faith statute makes clear that the General Assembly was concerned about some insurance companies “disregarding” their legal obligation to adequately pay claims. Due to this concern, the legislature required the MIA to provide information to it regarding administrative action taken under the Unfair Claims Settlement Practices Act. Insurers would prefer to avoid administrative investigations, market conduct examinations, and enforcement actions that could conceivably be triggered by an adverse finding on Section 27-1001 complaints. Adverse decisions could also conceivably prompt some creativeness by plaintiff attorneys. For example, a creative plaintiff’s attorney could review an adverse Section 27-1001 decision and contemplate a class action. While such class actions might be difficult to pursue in Maryland under existing law, other states might allow such an action, particularly if the action at issue could be described as a pattern or practice of an insurer. Similarly, while punitive damages cannot be awarded on a Section 3-1701 claim, other state laws are more plaintiff-friendly. Some insurers are concerned that an adverse lack of good faith decisions could be used in civil cases outside of Maryland to support, in a similar case, an award of punitive damages. Insurers are also concerned about the impact of an adverse decision on their brand. No insurer wants to be known as callous or unprofessional. In the digital world, an adverse decision can have an impact on an insurer’s image by the almost instantaneous distribution of adverse determinations by twitter, blogs, and email. 9. In order to win a lack of good faith claim, the insured must show there was a breach of the insurance contract. An insured will not be able to pursue a lack of good faith claim unless the insured can prove that there is a breach of the insurance contract. Cecilia Schwaber Trust Two at 488, n. 6; All Class Const. LLC, Mut. Ben. Ins. Co., 3 F. Supp. 3d 409, 416 (2014). Thus, if an insurer correctly denies a claim, the insured cannot recover under Section 3-1701. This is contrary to what many insureds and their counsel believe. They wrongly believe that the law allows a lack of good faith claim to be pursued merely because the insured perceives that an adjuster has acted in a rude, disrespectful or unprofessional manner. While no insurer would ever want an adjuster acting in a manner that is not professional, the lack of good faith law does not apply to situations where a rude adjuster makes a correct claims decision. 10. 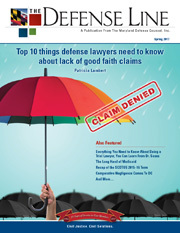 There are numerous issues that remain unexplored concerning lack of good faith claims. Maryland’s lack of good faith law is approaching the ten-year mark. Despite this, there are many issues respecting lack of good faith that are relatively undeveloped. For example, how is a lack of good faith trial to be handled? How does the statute apply when an insured believes that the defense of a third party liability claim is being handled inappropriately? Are the coverage issues to be bifurcated from the lack of good faith claim, particularly since coverage must be found in order for such a claim to be pursued? What jury instructions are to be provided with respect to such claims? How does the final administrative decision impact the civil case, particularly considering issues of res judicata and collateral estoppel? These and other issues remain. All of this means those who practice in the field will remain busy. Ms. Lambert has over 25 years of experience in handling complex commercial litigation and insurance matters. Ms. Lambert has worked on national class actions, significant litigation and regulatory matters for Fortune 500 companies. She has also assisted small and mid-sized companies and business executives with contract, real estate and commercial disputes that needed to be resolved quickly and efficiently. Ms. Lambert is best known as an attorney who knows the field of insurance. She has represented insurers, policyholders, and insurance producers in disputes both in court and before the Maryland Insurance Administration.